Well, what's there to say about Whistler Mountain Bike Park-not much, except that it's the number one mountain bike park in the world. This mountain is massive. It became even bigger last year with the operation of the Garbonzo Chair, which opened up a whole pile of new runs. Whistler has tons of trails ranging from green to double blacks. My favorite three trails are A-Line, Dirt Merchant, and Freight Train. These are mostly made up of jumps, step-ups and step-downs, so you get like 250 jumps from top to bottom. 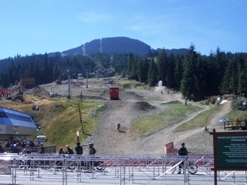 Whistler is also unique because they have a slope style course. This is right under the chairlift so you can watch people doing stunts as you go up the mountain. It has crazy stuff like massive wall rides, huge jumps, drops, crazy ladders, and a mountain-cross course. Every summer Whistler hosts a huge competition called Crankworks where riders go huge off this slope style course. Just starting, no problem! Whistler has lots of green runs perfect for beginners. The harder trails even have easy way-outs, if you're not looking for a challenge. Whistler is a great place to improve your biking skills. For example, they just opened a new run called Crank-It-Up, which has smaller jumps. When you're comfortable with those, you can move on to harder ones like A-Line or Freight Train. While we're on the subject, the GLC drops are also progressive; they have 3 drops, a small ladder drop, a medium rock drop and a big drop. That's how I got started, by going down the ladder then slowly trying more challenging drops. Even the stunts at Whistler are designed to help you get better every step of the way. With thousands of people going up the mountain every day, the trails do get worn down. Luckily Whistler has a crew that works on keeping the popular trails smooth for you. Equally as important, you'll find a handful of repair shops to fix those ongoing repairs. Last time I went up my friend Andrew who spent an hour (of my biking time) looking for the cheapest deal on changing a flat tire. What the heck-it's a ten buck deal! If you' re only there for the day, and don't have much time to bike, don't worry. They have a massive FREE jump park (next to the Skateboard Park) ranging from tabletops to large gap jumps, and two ladder parks with lots of skinnies and drops to practice on. Did I mention the skateboard park where you can do some urban riding? As well, there's a connection of trails you can ride around the village for free ranging from green to black. Even these trails are really well made. Finally, when you're totally tired and hungry, the village has no shortage of eating places. If you're on a budget, head to McDonalds or Kentucky Fried, but if you feel like splurging there are plenty more to pick from. Oh, I almost forgot, Whistler has shopping too. Ask my sister Jen, she'll tell you all about it. Mountain biking can be done by everyone from kids to adults. But you need to be in decent shape, and of course, have the proper safety equipment like a full face helmet, and body armour. Check the website below for current rates. Be prepared to spend a good chunk of change. This mountain is awesome. Some of the best runs in North America. Mountain bikng is one of those sports where it helps to have a fat wallet.